As all Year Nine boys, past and present, can no doubt recall, in 1914 the Russians mobilised with almost reckless haste to join the First World War on the side of their French and British allies, thereby contributing to the failure of the German war plans devised by Count Alfred von Schlieffen. Britain immediately sent men and ships to help supply her ally, including Lieutenant Commander Robert Halahan OA, who by this time was in command of submarine E18 in the Baltic. After around nine months of service aiding the Russians, Halahan lost his life in late-May or early-June 1916, his operations being shrouded in mystery, but crucial enough for Tsar Nicholas II to take the highly-unusual step of posthumously awarding him the Order of St George later in June. 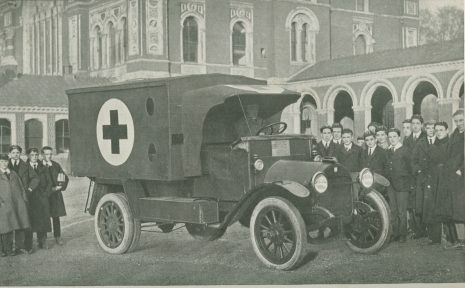 Closer to home, the Old Alleynians and the then-pupils of Dulwich had spent the autumn of 1915 raising money to purchase a motor ambulance for the Russians. Backed by the then-Master George Smith, fundraising efforts were so successful that the £450 necessary to pay the RAC to send an ambulance to the Eastern Front had been raised within three weeks, with a further £125 subsequently sent to provide for the upkeep of the vehicle. Despite the efforts of Halahan, the OAs and boys of Dulwich College though, the Russians remained inadequately supplied and technologically overpowered. Tsarist forces gave a poor account of themselves with disaster following disaster on the Eastern Front. One notable exception to this picture was the hugely successful Brusilov Offensive, in which tactics later embodied in the concept of Blitzkreig allowed the Russians to inflict a devastating defeat on the Austro-Hungarians. John Keegan assessed Brusilov’s campaign to have been the most successful since the Race To The Sea had caused the war to become one of attrition, fought out in trenches. Nevertheless, even these impressive advances turned to dust as supply lines failed or fell foul of German counter attacks. In a hideous miscalculation, Nicholas II, eager to be with his men and provide them with guidance and encouragement, went to the front himself, thus implicating himself in the malaise of defeat and leaving the Russian population beholden to the influence of Rasputin and the Tsarina. His regime, and the Romanov dynasty with it, was easily toppled in February 1917. In its place came the so-called Provisional Government. After initially adopting a defensive stance in a war that had become hugely unpopular across Russian society, Kerensky made a similarly disastrous decision to restart an offensive campaign in the summer of 1917. Despite almost perpetual unrest and governmental incompetence, it was nevertheless a surprise when the Provisional Government was overthrown by a Bolshevik coup in October and Russia quickly descended into a near-anarchic state of civil war. Under the international banner of the North Russia Expeditionary Force (NREF), the 6th Battalion, Yorkshire Regiment was sent to the Murmansk-Archangel sub-Arctic region to fight against the Bolshevik Reds on the side of the disparate, counter-revolutionary Whites. Amongst their number was Captain Tom Bailey OA, formerly a member of the 1st XV, graduate of Clare College, Cambridge and a noted geologist specialising in the discovery and extraction of rare minerals, particularly in Africa and the Asian sub-continent. On 22nd March 1919, Tom was awarded the Military Cross for his role in leading his men in the assault on Bolshe-Ozerki; however, he was killed on the 2nd April, before he had found out about this award. Ernest Shackleton, having long been eager to serve, was deployed as a Major in the NREF, where he was instructed to use his expertise in supplying and surviving in Arctic conditions. Accounts show that he mixed well with his new colleagues and his expertise was valuable in marching the Yorkshire Regiment (presumably containing Tom Bailey) across several hundred miles of rough polar terrain to relieve a beleaguered American unit south of Murmansk. Nevertheless, he found much of the work mundane and resigned his commission later that year to prepare for his final Antarctic mission. In the end, despite international efforts, the White campaign floundered with divisions rife and Trotsky’s Red Army resurgent. With all their international allies lost, the Whites capitulated in 1921 and the scene was set for the ‘short’ Twentieth Century.